Thinking of getting an Apple TV? Here's everything you need to know. APPLE TV IS a small, square box that uses an Internet connection to stream movies, music, and more to your TV. Content is accessed through a variety of channels that populate the Apple TV home screen like apps. As I said above, the entry-level model retails for $69/£59/AU$109, and can sometimes be found cheaper depending on the deals Apple has going. Refurbished units pop up at Apple.com at a discount, and past specials have paired new units with iTunes cards. There have been a few revisions to the hardware over the years, so if you buy used, be sure to get a third-generation unit (which first hit the market on March 7, 2012), otherwise it won't be capable of displaying video at full 1080p HD. Retail chains sometimes charge ridiculous prices for HDMI cables, so if you can't find a fair deal, order online from sites such as Amazon or Monoprice. TO MAKE APPLE TV WORK, you need to connect it to the Internet. A wired Ethernet connection is generally more stable, but Wi-Fi works just fine as long as the Apple TV is getting a strong signal from your wireless router (you can check signal strength on the Apple TV at Settings > General > About). To connect the unit to your TV, you need a standard HDMI cable (sold separately for as cheap as $3/£4/AU$4, depending on the length). If you want to hook up surround sound, you can use an Optical audio cable. The new Apple TV remote is packed with cool features, but it's made for the tiny hands of Keebler Elves. APPLE TV COMES WITH a remote that's super simple to use, but is kind of flimsy to hold — it's too thin and tiny to get a good grip on. It's not a major issue, but you might be better off using the free Remote app that lets you control Apple TV with your iPhone, iPod touch, or iPad. This is by far the best option for typing the names of movies or TV shows into, say, a Netflix search field, since it takes forever to seek out letters with the arrow keys or touch pad of a regular remote. 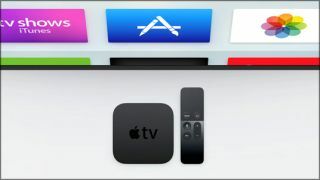 The remote that comes with the fourth-generation Apple TV (pictured above) has extra functions, such as a microphone for Siri commands, a clickable touch pad, and motion-control sensors. Apple TV also comes with a power cord, and that's it — as I said before, you'll need to buy an HDMI cable separately. The Apple TV channel lineup grows and gets better every year. VIDEO-STREAMING APPS cover a wide variety of content, everything from YouTube videos to live sports to HBO, and new ones are added regularly. The better ones usually require a paid subscription for access to anything more than a few sample shows, either with the content provider (such as Netflix and Hulu Plus) or a cable/dish company (such as Comcast or Direct TV). For a look at some of the top-line video apps, check Apple's official page. Some apps, such as MetalStorm: Wingman, go the extra mile with creative AirPlay features. APPLE TV CAN ALSO stream stuff from your Mac or iOS device — it can even mirror exactly what's on your other screen. (Some apps don't support this feature, though.) You can buy music, movies, and TV shows through various channels, and stream any iTunes content you've bought on other devices — anything purchased using the same Apple ID. Apple Music subscriptions and iTunes Radio are also supported, and with My Photo Stream, you can pull your latest photos and videos down from the cloud to view on your TV. Apple TV even works with Apple's Family Sharing, so you can pull content associated with multiple Apple IDs. With so much functionality and interoperability with the rest of Apple's ecosystem, adding an Apple TV really is a no-brainer.